Scatterbrained. Forgetful. Absentminded. Distractible. If you find these words thrown around frequently, well, you aren’t alone. The busier life gets, the easier it can be to forget the little things like your glasses, wallet, or house keys. Thankfully, advances in modern technology offers assistance for those of us who might lose our heads if they weren’t attached. If you tend to be scatterbrained, you’ve probably seen (or invested in) the package of sensors you can attach to those often-lost items. The trick, of course, is not losing the remote or tracking device so you can find all your sensored items. If you tend to lose your keys frequently, one of the easiest ways to help yourself is to invest in a keyless entry system or two! A keyless entry system is pretty much what it sounds like. If you’ve ever noticed those button or numerical key pads on some businesses or apartment buildings, you’ve seen a keyless entry system. Thankfully, these great systems are getting smaller and less expensive, so they aren’t relegated strictly to businesses any longer! 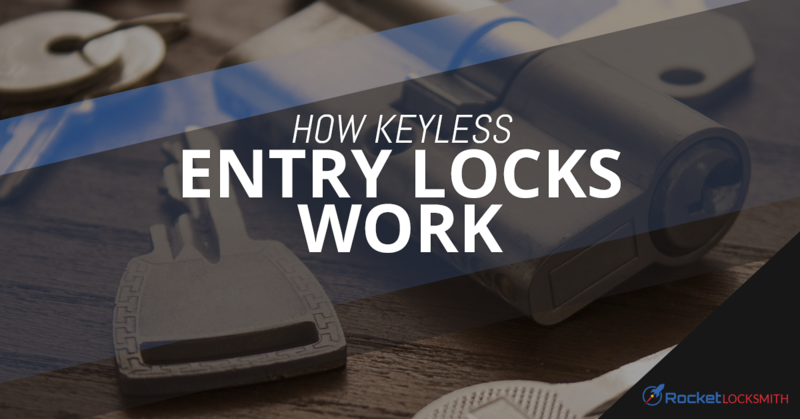 Essentially, all a keyless entry does is replace your deadbolt—and sometimes your door knob too. It offers the same level of security as a properly installed deadbolt, but relies on a programmed code to open, rather than a key. Instead of finding your keys in the great depths of your bag, you can simply punch in a code of your choosing and the door will unlock. Sounds easy, right? The good news is, once your keyless deadbolt is installed, there’s really no mess or hassle. The installation is the most complicated part, and that is something your local St. Louis locksmith, like the team at Rocket Locksmith, can handle easily for you in about an hour. Once installed, all you have to do it program in the code or codes you want, and you’re ready to go! To make things even easier, many modern keyless entry systems are designed to connect to your home’s wi-fi signal. With an internet-connected system, you can generally program and change codes easily from your smartphone or computer. You will need to keep an eye on the battery, but most systems will give you fair warning when the battery gets low, so you never have to worry about being locked out. Of course, because this is a fair concern for those of us who can be forgetful, you’ll want to check with your local locksmith or the lock’s manufacturer to see what measures are in place in that particular system to ensure you don’t get locked out of your home. Set multiple codes – If you have a housekeeper, nanny, or someone else who needs to come to your home regularly, a keyless entry system is a great way to keep track of their comings and goings while keeping your home secure. Most keyless deadbolts allow you to program multiple codes, so you can give them one for their use only. Then, if they stop working for you for whatever reason, you can cancel that code and program a new one, so they can no longer enter. This is much safer than trying to remember to ask for your key back. Track entries – The keyless entry systems that connect to the internet generally offer a unique feature: they can be tracked online or via smartphone app. Since you can program multiple codes in at once, you can know who is entering your home as soon as they do so. Many of these connected systems even offer email or text notifications as soon as a code is entered. This way, you can see that your kids have made it home safely, even though you’re stuck in a meeting at work. Change codes anywhere – This feature is restricted to the internet connected keyless entry systems, unfortunately, but it is a handy one. Simply log in online or to the smartphone monitoring app and you can cancel existing codes or start up new ones. This is a key feature for vacation rental owners who don’t live near their property, as it allows them to set individual codes for each guest that expire once that guest’s visit is over. Add ease to your life, improve your home’s security, and ditch your keys! Contact Rocket Locksmith today for keyless entry lock installation, lock re-keying, and more. Submit our contact form online or call for emergency locksmith service today!